Remy is todays standard of hair extensions. It is not a hair manufacturer or a brand, just a name that is used to describe hair that has come from one donor, with the cuticles in-tact and all hairs still aligned in their natural growth pattern (all cuticles going in the same direction). Non-Remy hair is taken from different donors and therefore contains hairs that are going in all different directions, which may get tangled and matted, especially in the long lengths. WHAT IS DOUBLE DRAWN VS SINGLE DRAWN HAIR? Double drawn hair is top of the line. Time is taken to pick hairs from multiple donors so that the majority of the hair (about 88-90%) is the same length. This hair is more expensive than Single Drawn hair because it takes much more time to sift through and match up the lengths. Double drawn hair is almost the same thickness from top to bottom for a very healthy and natural look. Single drawn hair will appear thinner on the ends and is more suitable for someone looking to add only a small amount of volume. Virgin hair is the best hair on the market. The cost will vary greatly depending on where it is from. Virgin hair usually only comes in darker natural colors (medium to dark browns) as it has never been colored or processed in any way. It is almost impossible to purchase virgin blonde hair and if you can find it, the cost will be enormous. Virgin hair will be very smooth and will last years, but excersize caution when purchasing as many companies falsly advertise “virgin hair” with processed hair. If its very inexpensive, its not virgin. Remember that prices of hair vary greatly depending of the quality of hair that you are buying. For example, single drawn hair will be considerably less expensive than double drawn hair. Remy hair will be more expensive than 100% Human Hair. If it doesn’t say ‘Remy’ then it’s not Remy hair, if it doesn’t specify ‘double drawn’ then it is single drawn hair. Be aware of what you are buying and remember that all hair is priced accordingly. If the price seems too good to be true, then it probably is. Move on. Because our hair is not purchased from factories, but sourced and manufactured ourselves, Kesh Luxury Hair Extensions is able to provide customers with this high quality of hair at a very competitive price. Most hair extensions these days are manufactured in Asian factories, regardless of where the hair is supposed to be from, and are typically mixed in with low quality, synthetic or even animal hair behind closed doors. We purchase our hair in a completely virgin state and then manufacture into tapes, wefts, clip-ins and bonds. 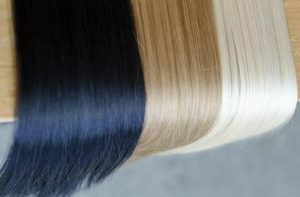 It comes in a variety of qualities, from completely unprocessed raw virgin Remy hair to 100% Remy human hair (has been coloured or texturized by request).